Just over a week ago, Apple announced the next instalments of it’s flagship product – the iPhone. Today they followed up those announcements by releasing two new devices, and giving consumers a choice this time round, an option of two screen sizes. A bigger screen is something that iPhone users have wanted for a long time, and it’s caused a lot of users to move to Android alternatives in search of more pixels, but is it too late for Apple to win back the customers who have taken the leap? It seems not. Reports have indicated a influx of trade ins for Samsung phones prior to the iPhone 6 release. Today my new iPhone 6 arrived. I opted for the iPhone 6 over the iPhone 6 Plus because I have small hands and I think that 5.5″ is too big for standard day to day use of a phone. Going for the smaller of the two comes at a cost, we lose out on higher pixel density, battery life, image stabilisation and landscape mode. Overall, I like the design of the phone, the curved edges take the phone back to its roots of the original phone through 3GS and gives the phone a smooth feel as it sits in your hand. One downside to this is that it feels loose in your hand, and without a case I can imagine it won’t be long until the phone will slip out of your grips. The on/off button being on the side of the phone is strange, I still haven’t got used to it. I don’t feel that the move is justified on the iPhone 6, I can still reach the old position of the wake button just as easily as I did with my iPhone 5. As with older iPhones the buttons feel robust and responsive. This is my first iPhone with Touch ID and so far it has worked every time without fail. 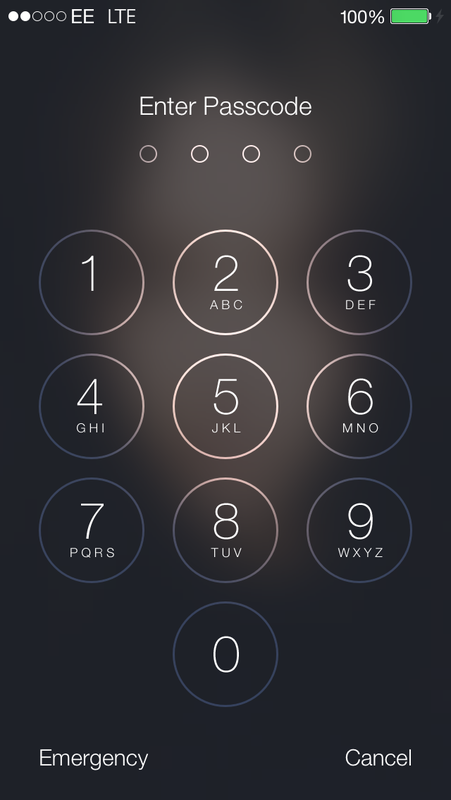 It’s going to take a while to get used to using it instead of my passcode though. The protruding camera was an odd move for Apple, and although it will grow on me in time (especially as it’s hidden by my case) I don’t think it was a smart move. I can’t imagine it was a design choice, it was more likely because they couldn’t fit the sensor in the thinner design, I think i’d have been happy with a slightly thicker device to hold the full sensor, that would mean it would hold a bigger battery too. I was expecting them to release some removable lenses (macro, wide angle) that could clip onto the extra rim of the camera. I doubt it will be long before someone else takes advantage of the idea. The display on the larger screen looks great, it’s crisper and brighter than the previous versions. You can also see the improvements they’ve made with viewing angles. But you can tell the pixel density hasn’t increased, which is one of the biggest let downs for me. I cannot understand why they haven’t upped the PPI in this phone like they have done with the 6 plus. Possibly to leave room for improvement next year? Maybe. So far i’ve had no issues with reachability, my hands are quite small but i’ve not had to adjust my normal tasks to accommodate for the bigger display. 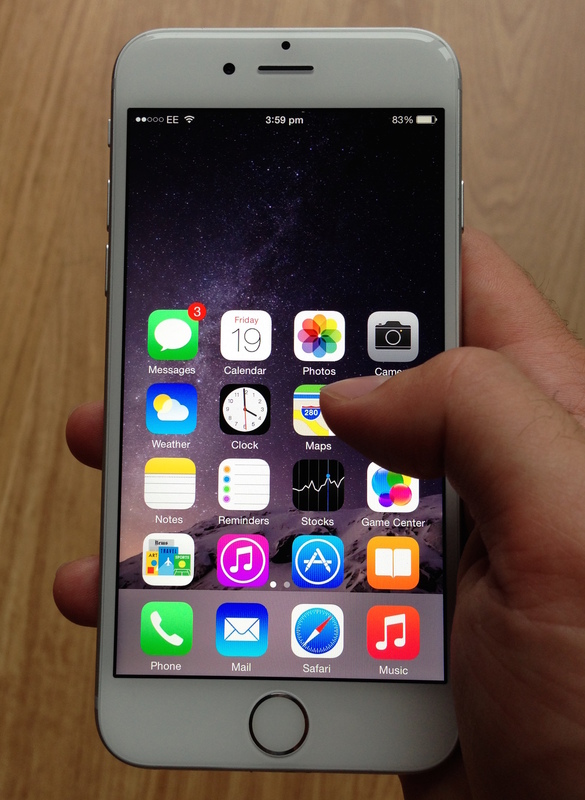 The new reachability mode as seen in the image above works well to prevent any pulled muscles in your fingers. My first impressions of iOS 8 haven’t been great. It’s a buggy release. I downloaded iOS 8 on my iPhone 5 last week which instantly broke my nike running app, and I haven’t been able to get it working since. The phone has crashed a few times and i’ve noticed lag between tasks. I’ve also noticed the phone running hotter than usual across both devices. 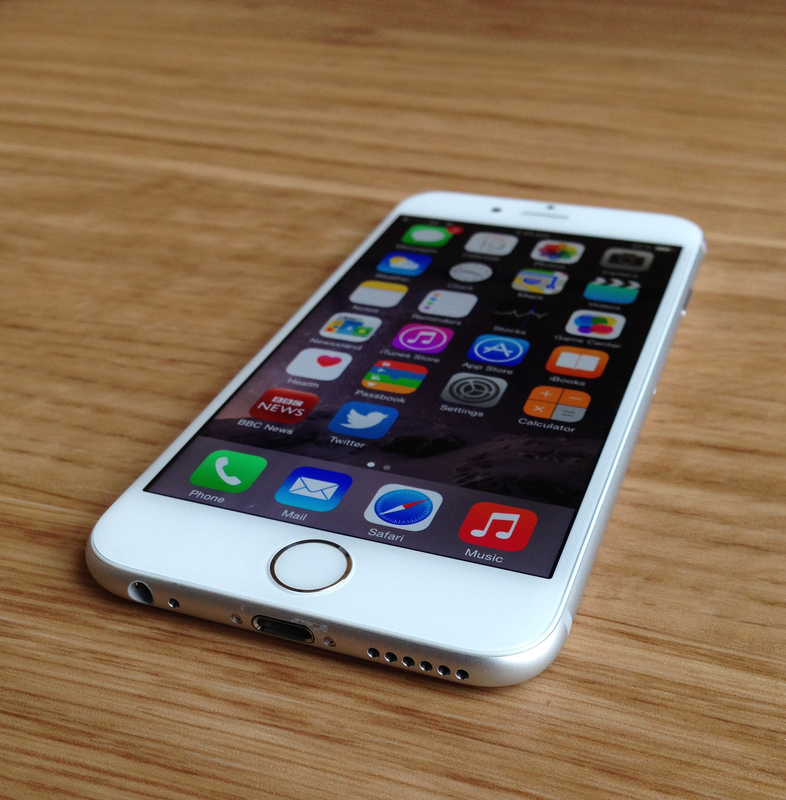 It’s dampened my opinion on iOS 8, and to me it’s the most disappointing iOS release to date. The upside is that these are all software issues, so hopefully they will be fixed in an update soon. I opted to go with the brown leather version of the case, as I have been impressed with my Apple Leather case for my iPhone 5 (See: The case that gives you a new phone). 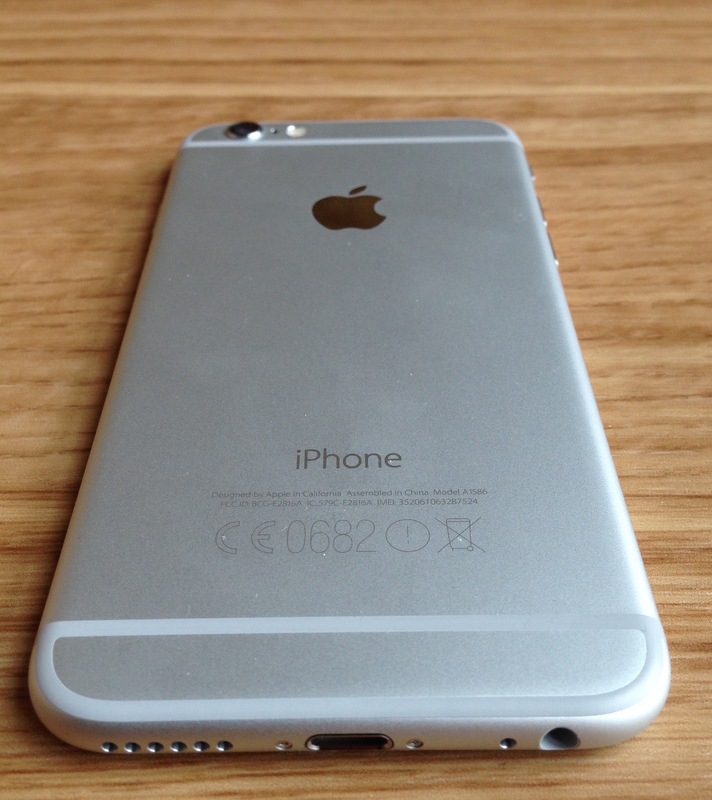 It is a nice case again, although I don’t prefer it over the iPhone 5 version. I don’t particularly like the lack of protection across the bottom and I preferred the tan colour to the brown. But overall it’s a nice, slim and stylish case that gives some friction to a somewhat slippy phone. I’ve not had the phone long enough to conduct a proper battery test, but early indications seem to show a better battery life than my iPhone 5. It isn’t draining anywhere near as quickly as my iPhone 5 has been recently. I’ve read in some reviews that the iPhone 6 has been coming out with better battery life than the iPhone 6 Plus, but i’m not sure how true this is. When the phone was announced last week I was unsure between going for the iPhone 6 or iPhone 6 Plus. Today I went down into the Apple Store to try out a iPhone 6 Plus and it made me realise I made the right choice. It is just too big for a phone. I can see that it would appeal to some people, but it’s defiantly not for me. The iPhone 6’s 4.7″ is a needed increase from the iPhone 5S, but I cannot see myself wanting a screen any bigger than that. The upgrade was worthwhile from my two year old iPhone 5, but if I was an iPhone 5S owner and wasn’t bothered about the 0.7″ screen difference then I’d probably consider waiting out until next year. Touch ID is a good feature for me but is already on the 5S, and Apple Pay won’t be widely used for a few years. The camera quality is better, especially with the improvements in autofocus, but there is only so much they can do without upping the megapixel count. To those sitting on the fence (Android users / previous iPhone users) you won’t be disappointed with the upgrade, especially if you want more real estate on your display. First of all it’s been a while since I’ve posted anything – I think life may have just gotten in the way. But as I sit here feeling those January blues on this dreadful Sunday evening, I thought to myself I would make my Sunday even worse by using my brain for something productive. Now that I’ve got the happy introduction out the way, let’s move on! Post-PC Era is a term used to describe the decreased PC sales in favour of mobile devices (tablets and smart phones). With the rise of tablets over the past years the Post-PC Era is a phrase that has been thrown around a lot, and every time it is mentioned I still feel as uncomfortable as the first time I heard it. When I think of Post-PC, I envision a world where tablets replace PC’s. This scares me. To an average consumer, it’s great, their device does everything they need it to using a simplified operating system. But to a more advanced power user it’s a nightmare. As much as device manufactures want to promote their device and applications with user productivity in mind, I strongly believe that you can not get the same amount of productivity out of a tablet. At the start of the tablet era, just before Apple announced the first iPad, I was hoping (more than anything) that it would come with a feature rich, fully functional operating system. Alas, it didn’t, and productivity in the early days of tablets wasn’t to be seen. I will give it some credit through, with the addition of better suited apps it is much better than it was. But even to this day I couldn’t use my iPad as a device for website programming, it is just not practical. I need a fully functional operating system will full versions of applications. There is still so much that a tablet restricts you to. 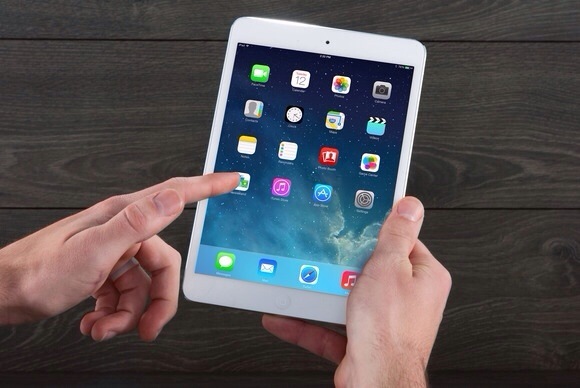 I have been through various iPads – I’ve had the iPad 2, iPad mini and iPad mini retina. Each time I have purchased one I have questioned over and over how it will fit into my life. I have a phone that does everything I need on the go, and my laptop that I use for all my more advanced tasks. I could never replace my laptop with a tablet so why do I need a one when my current devices do everything the tablet would? I don’t think the full sized iPad is the way to go. After my iPad 2 I was very much ‘anti-tablet’, it was too big and bulky and I hardly used it. I could have just carried around my laptop instead. It was too big to play games, read books, or watch movies on. So when Apple released the iPad Mini, my interest in tablets resurfaced, and eventually I purchased one. The iPad mini is fantastic for reading books, it’s about the same size as a book so it just feels natural. The screen on the retina makes the text look crystal clear too. It’s also brilliant for playing games as it’s lightweight and easy to hold, and watching TV no longer requires a gym membership to hold the device up for long periods of time. Even after being happy with my iPad mini, there was still doubt in my mind. How will this fit into my life? Will I stop using my phone or laptop? I don’t want any of my devices to be redundant! Now I think it’s key to really think how tablets have emerged and become so popular, so quickly. It’s provided easier accessibility to the internet for people who were reluctant to use a big scary computer. Any idiot can pickup a tablet and use it, they are intuitive devices, and this is where the majority of their market share comes from. However, for the more ‘techy’ folk, this isn’t a replacement device, it’s a new device completely. I still use my laptop for the more advance tasks and I use my phone for simple tasks (like making phone calls!!!). My iPad seems to have flown right in and settled as a new device in its own right. It’s that interim device that I can use when I am not on foot, such as at work or on a train commute. 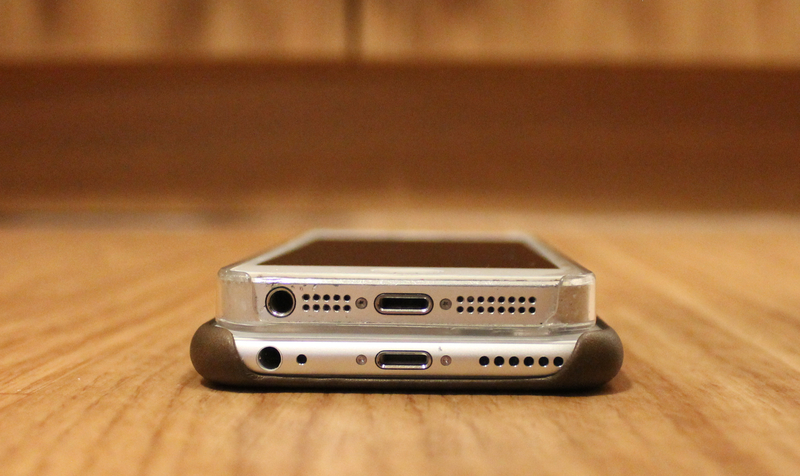 It doesn’t replace my existing devices – it extends them. It may mean that I use my phone and laptop less, but, thats all for good reason. Yes – It has taken me 4 years to finally fit a tablet into my lifestyle. No – The Post PC-Era is not reality, its a marketing ploy. A Post-PC Era indicates a time after PC’s. Mobile devices will not replace PC’s (completely), they will work alongside them for a long time to come. No, of course not. It isn’t going to be called Crayola, but i’m not far off as iPhone 5 Colour seems like a very safe bet. I haven’t blogged for a long time due to my lack of time to do so, despite spending the majority of my life sitting at a computer desk I do not have the time to allow my thoughts to be put into blog form. However, it’s getting to a very popular time of year in terms of technology, and this is a subject that I cannot pass up writing about. It’s become no secret to the world that Apple are releasing a budget iPhone in the fall, no official announcement of the sort but an abundance of panel leaks have proven that we will be on the receiving end of a budget iPhone in an assortment of colours. Well that is a good question. Many people might think that the iPhone is already a mass produced product, so why release a less powerful, plastic version when you can just get the latest high-spec one with diamond cut “chamfered” aluminum housing? To win over the cheap budget Android phone users is why. Although a budget iPhone may not sway existing iPhone users to a new phone, it is certainly going to bring in a new wave of iPhone customers. Presently, people who have an iPhone can not only afford one, they generally want to have one. People that don’t have one are sitting on the fence of being unsure of owning one, and eying up that cheaper Android alternative. There is a perfect gap in this market for Apple, they know they already have their existing high-end customers with the standard iPhone. The people who are caught on the fence, and ultimately end up going for a cheap Android handset on a £15/month contract will now have the option of a better quality iPhone alternative for roughly the same sort of money. Maybe I am being bias here by saying the cheap Android aren’t good quality, but it is true. I have nothing against Android phones and the Galaxy S 4 is a fantastic phone, but it is up there with the same price range as the iPhone. The cheaper phones are rubbish, and if someone releases a high quality low spec phone it will be a massive goldmine for the first past the post. The only mistake I see Apple are making with this launch is timing. As part of their yearly refresh of phones they have a major launch one year followed by a spec bump launch the following year, usually giving the iPhone a trailing “S” on the spec bumped model. By releasing the low budget coloured phones alongside the “S” model, may be enough to pull away the people who are sitting on an iPhone 5 and unsure of whether to upgrade to a 5S. If you are one of these people, and are not satisfied with the difference between the iPhone 5 and the iPhone 5S, you may find yourself considering going for the C. As it’s something different and something new. Apple will have to be very careful not to pull away their current customers onto the cheaper model, they must market it perfectly for it to work and provide a clear gap between the two markets they are now targeting. Apple may have lost some of its innovation since Steve Jobs, but they still have a huge team at their disposal, and if they market the iPhone 5C right it will be a huge success for them. I just hope that it’s followed closely by something new and innovative. If you had read my previous blog, you will have seen that Apple recently announced the next installment of their mobile operating system – iOS 7. Since writing my last blog I have had the chance to download, install and use the operating system for a few days. I am starting to get to grips with it. Prior to installing I was very skeptical about it. I did not like the idea of flat design as I believed that it was going against everything that Apple had always “been about”. I felt like Apple were giving in to their rivals, because lets be honest, there is nothing innovative about iOS 7. Its practically a polished up Android design. One of the reasons I own Apple devices is because I’ve always liked the easy to use, skeumorphism designs that the company are known for, and turning to flat designs made me question if it would be better to go for another phone that have had more time to develop their ‘flat’ designs. Such as the Samsung Galaxy S4, which is a very nice phone indeed. However, after using the new operating system it is clear that Apple’s take on flat is very different, and much better than first pictured. Even though iOS 7 looks different to previous versions, you can tell that the six years worth of work that the team at Apple have put into this operating system still exists. The very core of the OS has not changed at all, it pretty much just has a new lick of paint with some added features. Everything works in pretty much the same way, we have new features such as the control center that gives us features that our long loved jailbreak SBSettings has provided us with for many years now. The only noticeable design change that has hindered the ease of use occurs mainly within the calender application and some other little aspects of the OS. The new design in many cases does not provide clear separation between different sections of various applications. 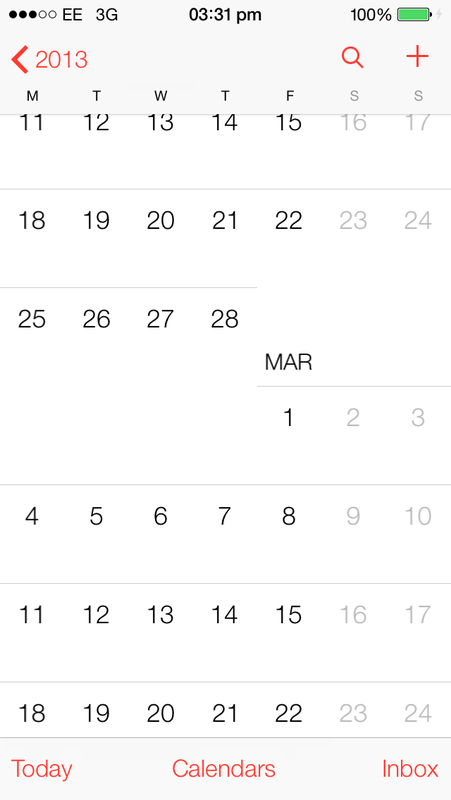 It is most noticeable within the calendar app where by there is no separation between the months. You can see this within the screenshot below. It can be confusing and a clearer method of presentation could be used. The design I believe is a refreshing update from what was a stale and outdated operating system. Although I was originally skeptical to move away from what I thought was great and worked the way I wanted, I now look back at iOS 6 on my old devices and wonder why I ever put up with the old clunky design. The new IOS makes much better use of the retina display too, the lockscreen is beautiful. 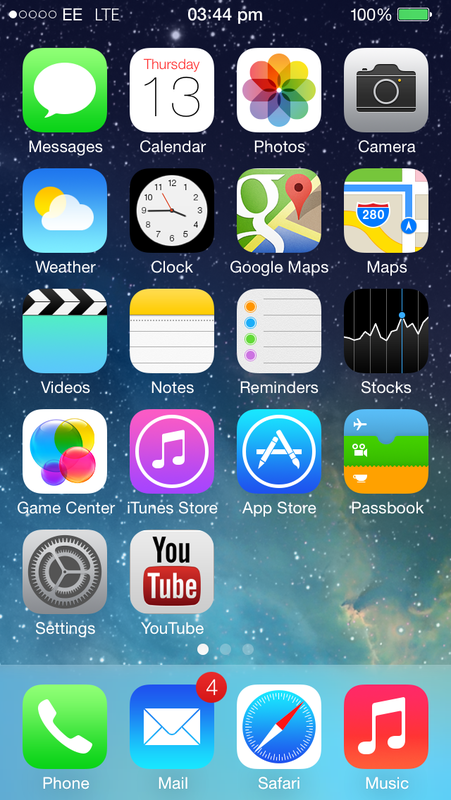 There is more good news about iOS 7 too, according to reports it is still in its very early stages of design. Between now and the public release there are going to be many different design changes to the OS, meaning we should not worry about some of those awful looking icons, as they are most definitely not here to stay. Jony Ive has also reported that it wasn’t actually his own design team that worked on the icon set for iOS 7. He passed on the task to the company’s marketing and website design team. A strange but clever move, because after all, why use the same designers that have been working on the old design when you could bring something fresh to the mix? I am very excited to see what the final product will look like. Jony Ive has only had 6 months to put this together, he now has a further 3ish months to finish the job properly. Facebook Home to pave the way to new mobile ecosystems? Facebook Home was announced a few weeks ago and it has caused a stir within the online community, with a lot of mixed views on the idea. Whether it will be a success remains to be seen, but it shows clues to the eventual fate of our mobile operating systems. When smart phones first launched (using the original iPhone as an example) the Application Store did not exist, we had several built in applications that without a jailbroken device we were forced to stick with. It wasn’t until a year later when the app store was launched, that we began to see the development of 3rd party applications that are now available in their hundreds of thousands (775,000 as of Jan 2013). In recent years we have began to see some of these 3rd party applications being deeply implemented into the operating systems, on iOS it began with twitter, then Facebook joined the ranks. While not a complete integration it allowed you to tweet and post straight from the operating system, removing the need to open the application. This move in my personal opinion is good, it increases the compatibility between the operating system and 3rd party applications, but I still tend to open the app myself to make posts. Facebook Home takes this a step further, instead of taking an operating system and building an application into it, Facebook have taken an application and built an operating system around it. Keeping Facebook as the primary focus of the OS. By doing this, Facebook can control what a user primarily sees on the device, and push relevant content their way (they can also push advertisements if they please). This is great for people who’s lives primarily revolve around Facebook, but these days that is a decreasing amount of people. For people who don’t want their phone covered in Facebook related content, or who just want to be away from social media, Facebook Home wont be a welcome addition. Following the announcement of Facebook there have been rumors that Facebook and Apple are in deep talks to bring this kind of integration to iPhones. The iOS operating system has not had a major update in some time, it’s signature application based layout has stuck with it since the beginning, and it is starting to get a bit stale, maybe we will see something new and fresh come WWDC this summer? What is all this moving towards? I cannot see application driven devices being around for much longer, it’s only a matter of time before all the major applications will be built into the OS from factory install, eventually make installing applications completely redundant (or at least purging all those crap applications that are clogging up the app store). Having a deeply integrated system is better in terms of reliability, it cuts out the need for a third party so compatibility issues aren’t as much of an issue, but it might give too much power to mobile phone manufacturers. We all know that Apple are already power hungry, to remove third parties from the OS would be a dream come true for them. Take a watch of the video below, if something like this was to be successful, deep integration of these applications into devices will be needed.